DJET SET DE FALGAS IS SOLD. Many Congratulations and thanks to Khalfan Hamad Al Qubaisi of Abu Dhabi. We look forward to the contributions DJET SET DE FALGAS will make in the UAE. 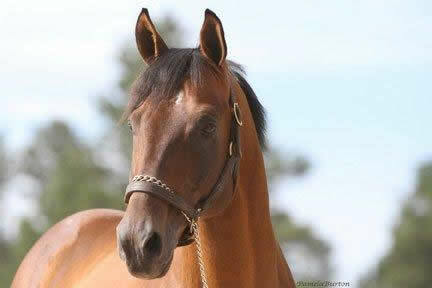 PLEASE SEE OUR HOMEPAGE FOR UPDATES ON HIS PROGENY AVAILABLE AT OUR FARM IN TEXAS. 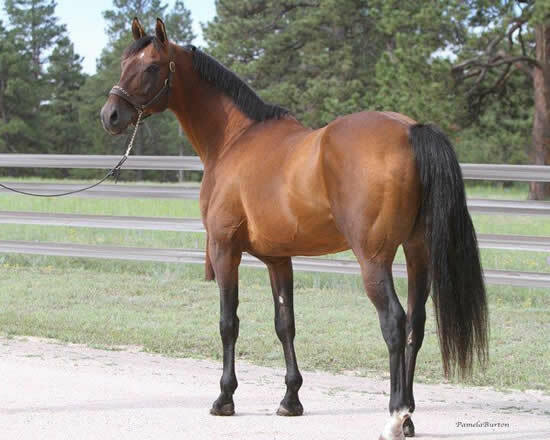 By ELIOS DE CARRERE, ('92 by Manganate, sire of VANESSA DU LOUP, DJENDEL, MAKZAN, DORMANE, etc. ), 4/16(3-4-5-2) in UAE, a track record holder who won or placed in 7 stakes races in France and UAE, 1st Coupe D’Al Asayl Stables of Abu Dhabi (Craon, 2200m), Prix Gosse Du Bearn (Agen, 1600m), 2nd Grand Prix De Divonne Du Pur Sang Arabe (Divonne, 2400m), Sheikh Maktoum bin Rashid Challenge Round I (Nad Al Sheba, 1600m), 3rd Al Naboodah Group Arabian Classis (Nad Al Sheba, 2000m), etc. Leading runners include DJET SET DE FALGAS ('01 c. out of Djezabel De Falgas) SUBJECT HORSE; and AIKIDO VEGE ('01 c. out of Agar Vege), 1st The Shadwell Dubai International Stakes, G1 (Newbury, 2000m), 1st Dutch open Junior Championship (Duindigt, 1800m), 2nd The President of the UAE International Challenge Derby G1(Newmarket, 2000m), Coupe D'Europe Des Chevaux Arabes (Chantilly, 1800m), 3rd Emirates Championship, G1 (Abu Dhabi, 2200m), National Champion of Holland 2005. 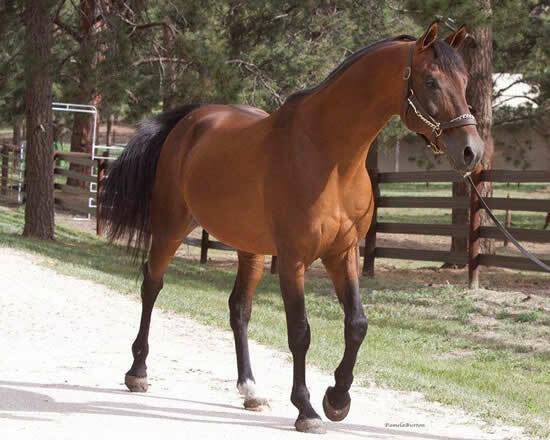 ELIOS DE CARRERE is out of the excellent dam Nerva Du Cassou ('72 by Baroud III), also dam of other winners and winner producers: Baco Du Cassou ('89 c. by Chéri Bibi) 2 time winner; NIZAM ('98 c. by Amer), 21(14-3-2)3-3, 1st HH The President Cup, The Zabeel Int,l Stake, The Emirs Sword; Danie du Cassou ('84 f. by Dahr), dam of DAHESS, 35(26-4-2) including 11 Group 1 wins; Praline de Cassou ('81 f. by Baroud III), dam of Kerra - Leading 3 Year Old, France; Noorah ('96 f. by Djelfor) race winner and dam of winners including Group 1 winner AL FATIH; etc. 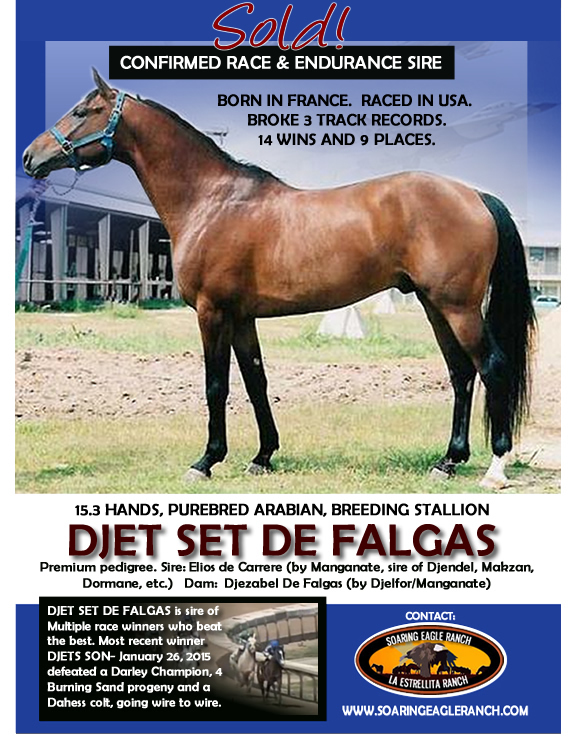 DJET SET DE FALGAS (SUBJECT HORSE). Eli De Falgas (’01 c. by ELIOS DE CARRERE), placed in France. 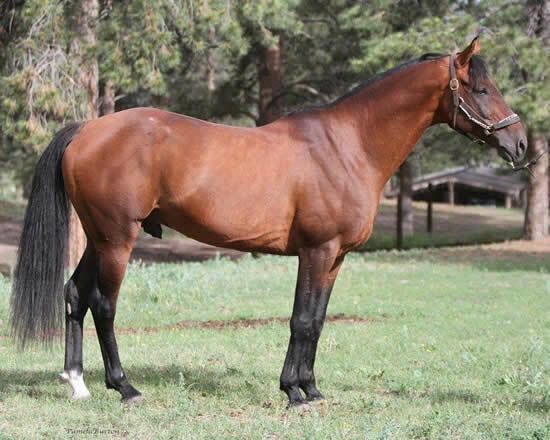 He is sire of 10 winners in USA including 2 stakes winners. Leading runners include HY HOPES JPL (out of TIKIS FRENCH KISS) - 3/11(3-5-2)0-1, ETRES CHIC (out of PEPTONS FAWOR) - 2/16(2-2-3)1-1, CHERE BEBE (out of FINALLY YOU) - 2/18(2-4-0), EBEAUCOUP (out of WIKINGS WIXEN) - 3/15(2-2-1)1-2, and EET CETERA (out of CS CRIMSON TIDE) - 3/13(2-2-2)0-1. Also of Maseratti CS ('08 c. out of Medaglia CS) exported, 1st 3 YEAR OLD PURE ARABIAN STAKES 1600M in Qatar; Al Hadla (’07 f. out of Fantasia CS) exported, 3/18(3-3-4) in Qatar all on turf, 1st TANMIYAH A- P/A MAIDEN PLATE 1000M (20 JAN 2011), 1st PUREBRED HANDICAP RATED 0-40 1500M (28 Feb 2012), 1st PUREBRED HANDICAP RATED 0-40 1200M (10 MAY 2012).